The VarIO is actually a half length Zorro II card but is highly versatile in how it can be connected and used. It provides your machine with a high speed serial port (460,800 baud) and high speed parallel port (ECP compatible). It's not limited to being used on the Zorro II bus. In addition to Zorro II use it can be connected to the Buddha, Buddha Flash, Catweasel ZII, ISDN Surfer, X-Surf even another VarIO and the A1200 Clock Port (with modification). Not only that but the card can be expanded itself. The VarIO also has an IOBlix emulation mode for the parallel port, although you cannot use an IOBlix simultaneously with the VarIO in this case. The parallel port pin-header must face the back of the machine. This means the component side should face the floppy disk drives in an A2000 and face upwards when installed in an A3000/A4000. A red LED will light up on the card to indicate it has detected Zorro mode. NOTE: For installation on other cards, you may require a software update which should be available from the manufacturers homepage. 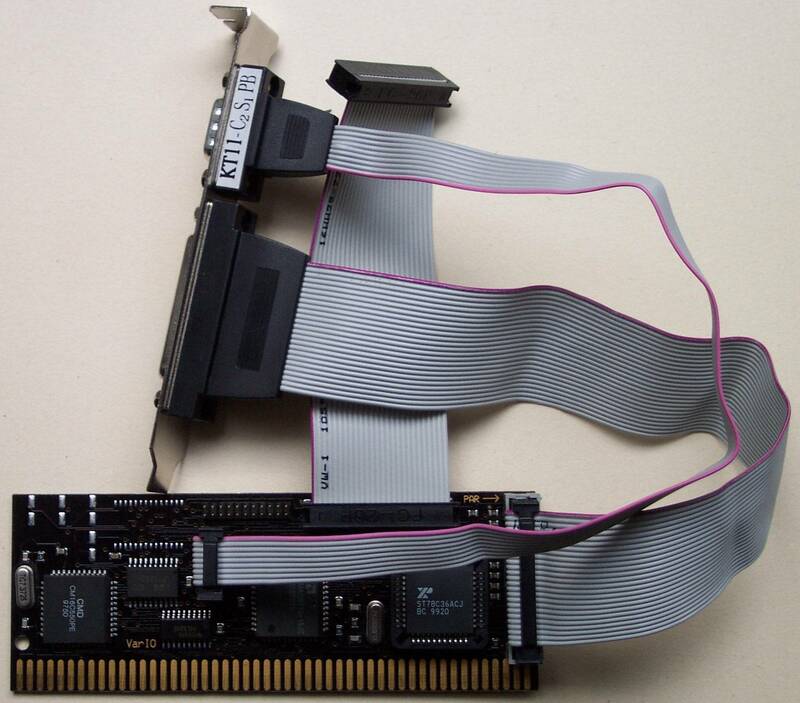 The board should have been supplied with a 26pin ribbon cable. This should be used to connect the VarIO to the 26pin expansion port on the other card. The only supported cards for this type of installation are Buddha, Flash Buddha, Catweasel ZII, ISDN Surfer, X-Surf and VarIO. You should not connect the VarIO to any other 26pin expansion port on other cards as their pinouts may be different. In particular the Hypercom (made before 97), ISDN-Blaster and Highway are not supported. If you connect the VarIO to an unsupported card, you risk damaging it. The cable has a red stripe which should be connected to Pin 1 on the 26pin expansion port of the VarIO, to Pin 1 on the 26pin expansion port of the other card. You should also insulate the Zorro II connector edge with insulation tape, before powering on to prevent risk of shorts. NOTE: Installation onto the A1200 clockport requires a modified VarIO because the VarIO serial ports require +12V and -12V and the A1200's clockport supplies +5V. IF YOU ARE NOT 100% CERTAIN THAT THE VARIO YOU HAVE IS MODIFIED FOR CLOCKPORT USE, DO NOT ATTEMPT THIS INSTALLATION. The A1200's clock port does not have any pin labelling although the pins are numbered from 19 to 40. The red marker on the cable must face pin 40 on the port. If you connect the VarIO incorrectly, it will be permanently damaged. The red marker of the cable must face towards the accelerator card slot and away from the PCMCIA slot. If you intend using a clock port on the Z4 busboard then please note that the labelling of Pin 1 is incorrect, this is actually Pin 19 and goes from 19 to 40. You should not have anything installed on the clock port of the motherboard if you use the Z4 busboard.